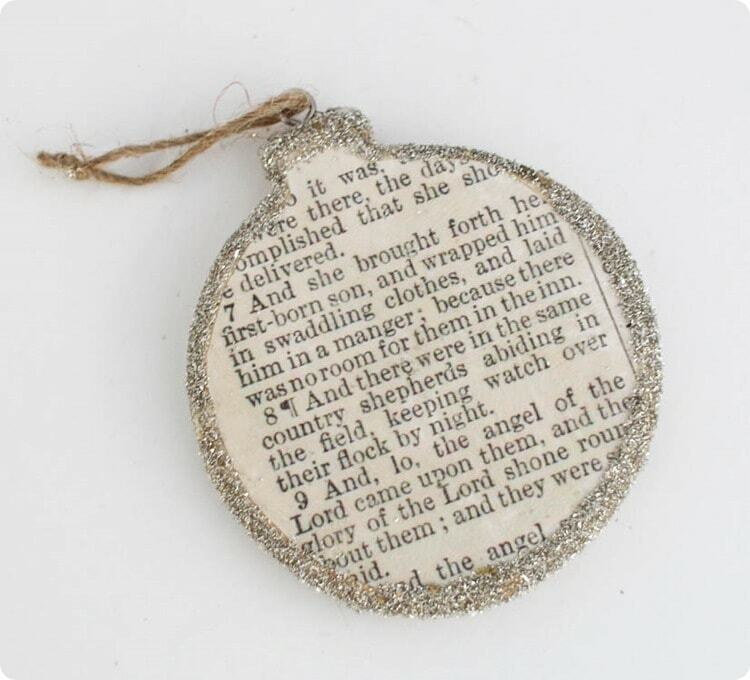 Birth of Christ Christmas Ornament - Lovely Etc. Every year I love to make a few new handmade Christmas ornaments to add to our tree. 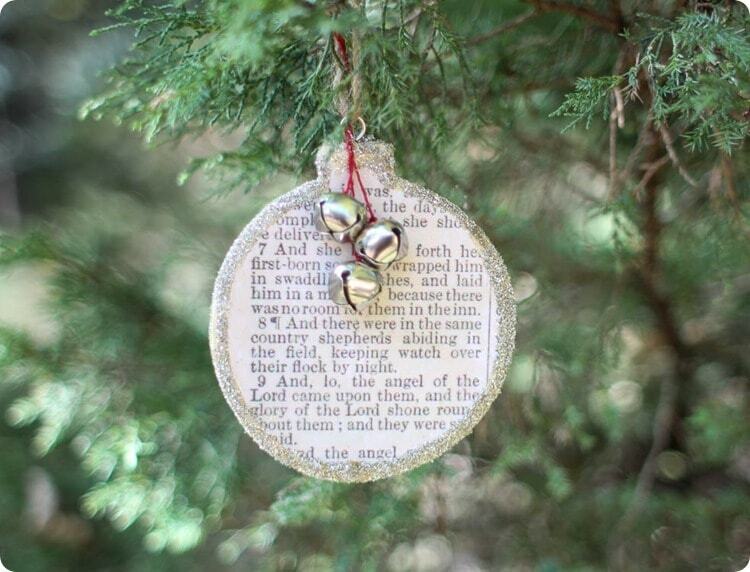 My favorites are ornaments that are beautiful, easy to make, and also meaningful. 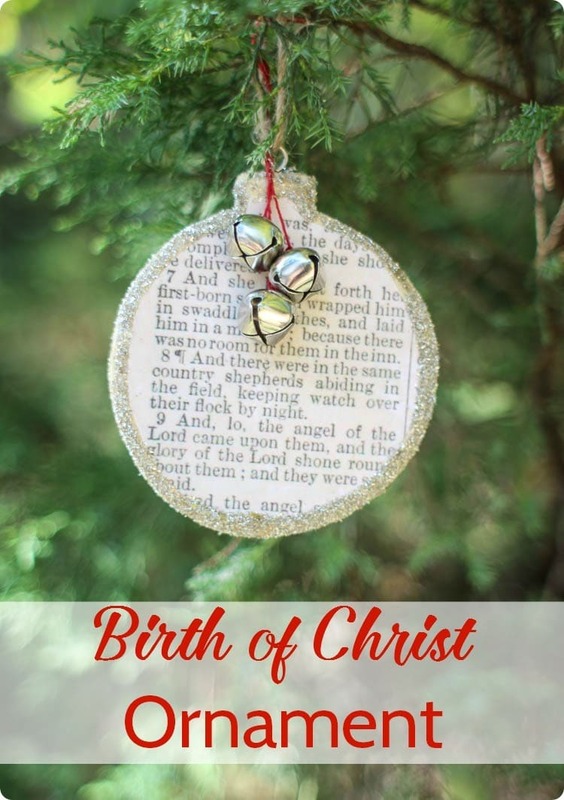 Today I am really excited to share my first handmade Christmas ornament of the year as well as fantastic ornament ideas from a whole group of other talented bloggers. One thing I really want to focus on this Christmas is keeping the birth of Jesus front and center in our Christmas celebration. As my boys grow older, it becomes easier and easier to get swept up in a wave of Santa Claus, Christmas wish lists, and fun decorating. And while I aboslutely love those things, I don’t want that to be all our Christmas is about. 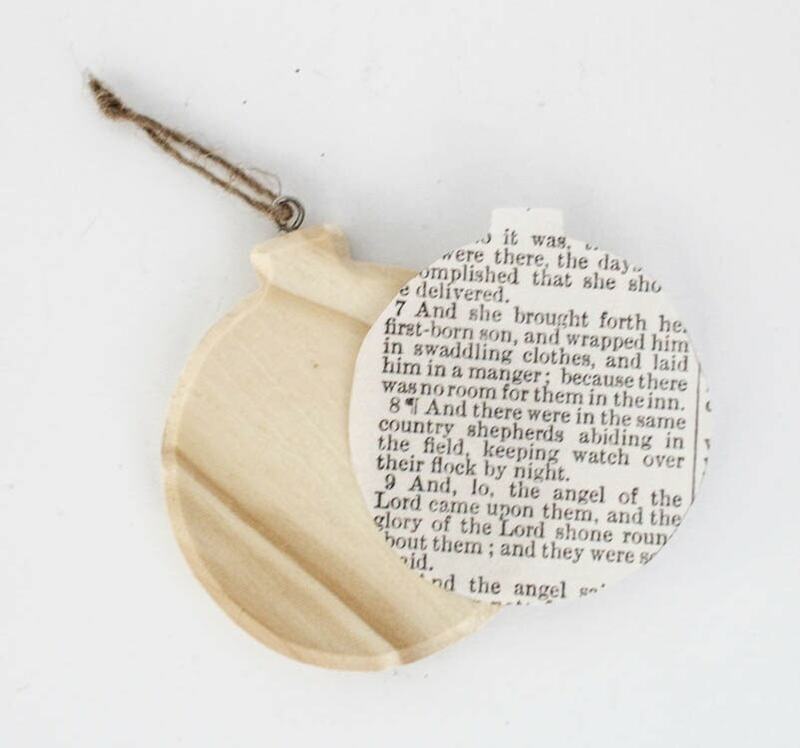 For me the true heart of Christmas is the story of Jesus’ birth, and that is what this ornament is all about. A couple of years ago I found this awesome little New Testament at an estate sale. It is dated 1911 and has several names written inside the cover. 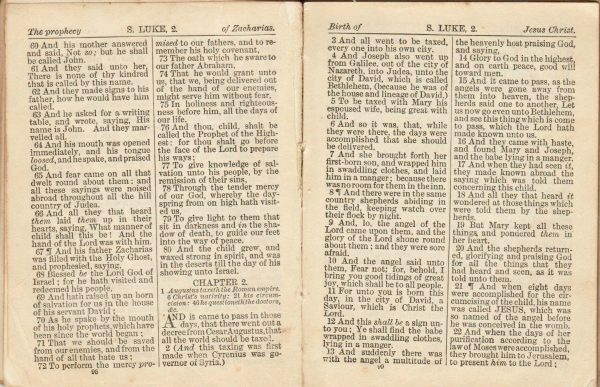 First, download and print out the verses from Luke 2. I have two versions you can choose from. The first version (above) shows the full two page spread from my little Bible and the second version (below) is the close up on Luke 2: 6-11 that I used for my own ornament. To download, just click the photo you want. Trace the ornament shape onto the printout and cut it out. I cut mine a little smaller than the ornament shape to leave a bit of a border. Brush matte Mod Podge all over the surface of the ornament and smooth the paper onto it. Once that dries, brush another layer of Mod Podge onto the top of the paper to seal everything down. When that has dried, brush Mod Podge over all of the exposed wood surfaces and sprinkle silver glitter on. I loved the simplicity of the ornament just like this. But I didn’t want it to get totally lost on the tree, so I added three little jingle bells hanging from red string. And that is it – pretty simple! I can’t wait to hang this on our Christmas tree this year! 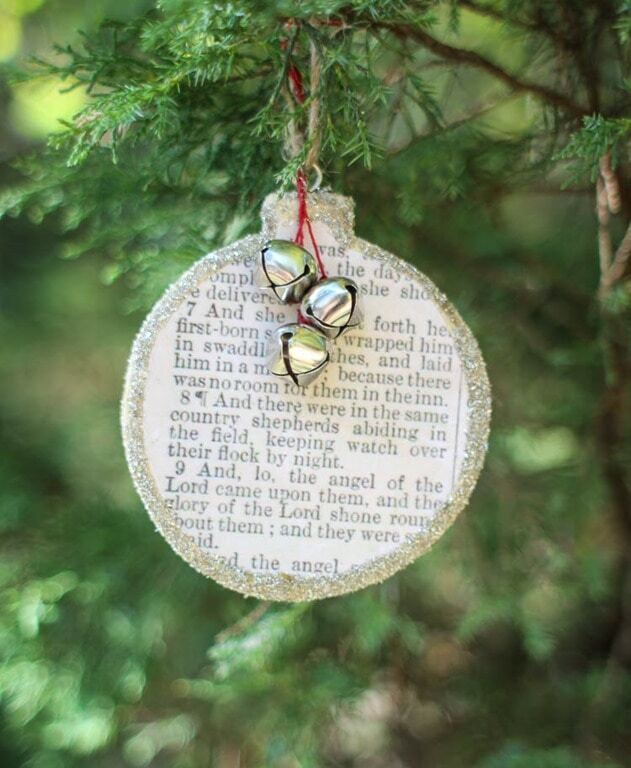 Ready for some more fantastic Christmas ornament ideas? You can see all of my Christmas ornaments from past years right here. 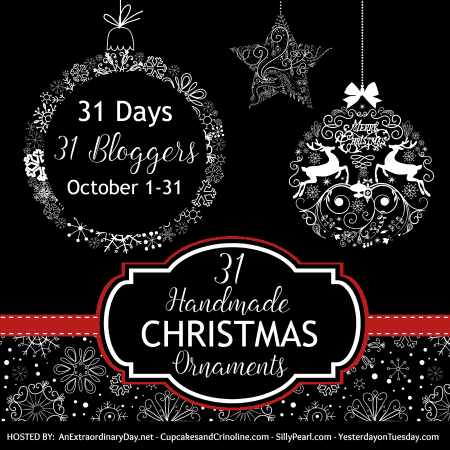 And then you are definitely going to want to check out all of the fabulous creations from the 31 Days of Handmade Christmas ornaments. There are some really fantastic ideas in her that I would love to make myself. Carrie, I am totally in LOVE with your Christmas ornament. It tells THE story and in the most lovely way. Thank you so much Diane! Thanks for inviting me to join in – I have had so much fun checking out everyone’s ornaments! This may be my favorite ornament shared this month. I love that you used a scanned page from a 1911 bible to create this. Way to remember the reason for the season while creating something beautiful for your tree. If I taught Sunday school, we’d make this for sure! Thank you Paula – and you’re right, this would be an awesome Sunday School project! Oh my gosh, I love this SO MUCH! I have pinned and stumbled and scheduled a share on FB; next I need to add this project to my holiday To Do list! 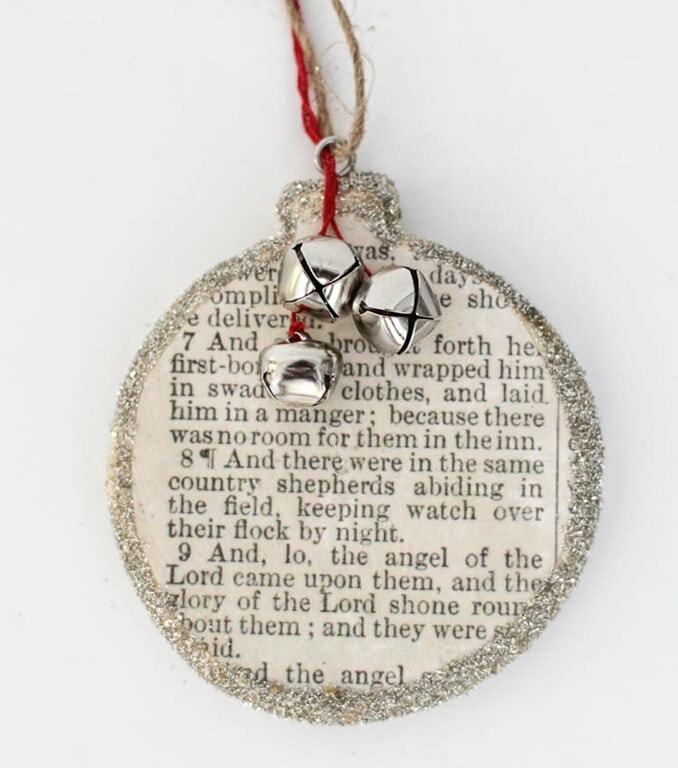 So so pretty, and the perfect way to keep Christ in Christmas. Thank you Kimm! You are the sweetest! This is just lovely in every way. I was so worried when I saw the bible and thought you’d maybe cut it up, but no, of course not! Such a lovely idea and so beautifully done. Julie, I figured some people would think I had cut it up! I love the ornament but it wouldn’t be worth destroying that old Bible! Thanks so much for your kind words! I agree with Paula, this may be my absolute favorite. And that is SO kind of you to share the printable! I agree with you about the old Bible and thinking about all the little fingers and the history it’s had over the years. This ornament is precious. Thank you for sharing it with us!! Such a gorgeous ornament, love the glitter! Thanks Kristin – you just can’t go wrong with glitter at Christmas! I really like your ornament, Carrie. I think it’s important to remember the true meaning of Christmas. Thanks for sharing this! 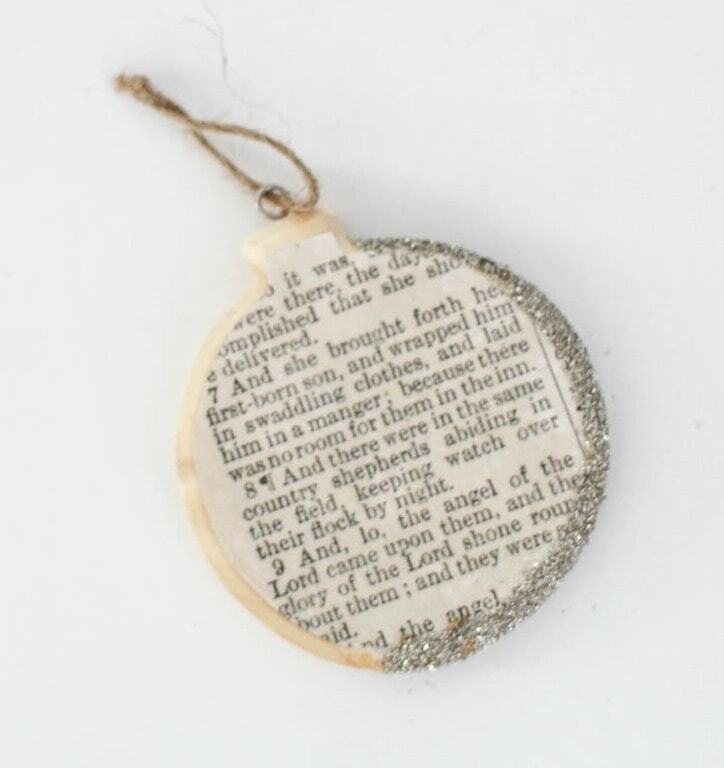 This is a lovely way to display your faith on your Christmas tree. I love this sweet idea. Meaningful ornaments are the best! Great that you are focusing on the real reason for the season. They are! I love meaningful ornaments so much – even if it is just something meaningful to our own family! What a special and meaningful idea for a Christmas ornament. Oh such cute and meaningful ornament! This is absolutely beautiful, and I love that it captures the true meaning of Christmas! Thank you so much Mary Beth! Such a lovely and meaningful Ornament!!! Love that you used lovely passages of the bible specially of that one being so antique! Gorgeous! I love this ornament. What a clever idea. I do have a question. You state, ‘Brush matte Mod Podge all over the surface of the ornament and smooth the paper onto it.’ Then you state to spread Mod Podge all over the wood surface. Where did you get the wood ornaments? Are you finishing the back side or is this double sided with the paper? Just another idea if giving this as a gift to someone…..use a wood burning tool and write the persons name on the back side. Cathy, I bought my wood ornaments at Michaels. As far as the Mod-Podge, I did two layers. The first layer acts as a glue to adhere the paper to the ornament and the second layer on top of the paper helps seal it all together. And I left the back of my ornament blank, but I love the idea of wood burning someone’s name into it. Or even the year would be a great touch! Very nice. 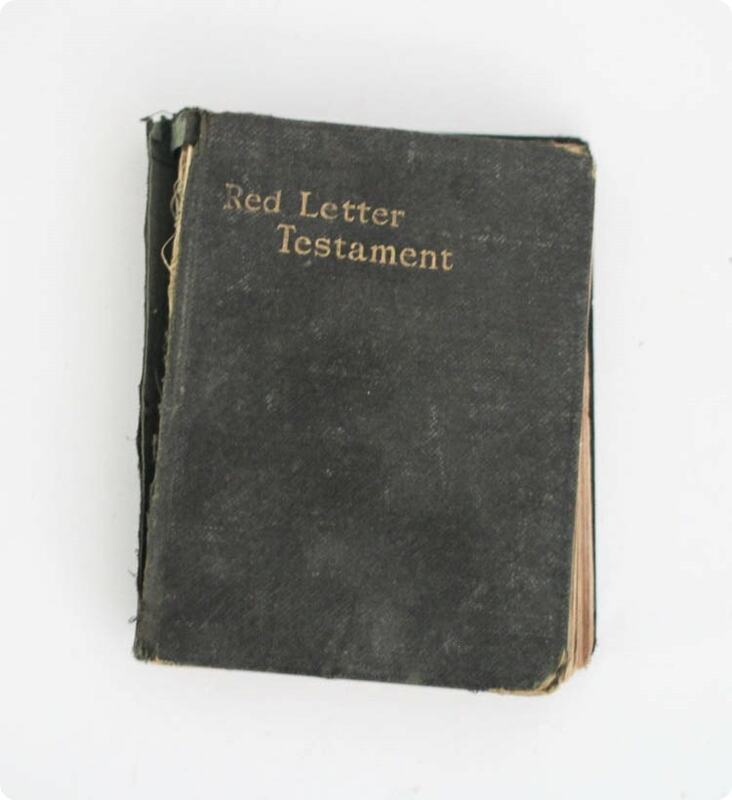 I have my grandma’s old bible – very similar. I would like to make these ornaments. What size are the bells? Hi Doreen, how special that you have your grandma’s old Bible! The bells are 1/2 inch bells. Hi, this is a special ornament! I made 35 of them!! Let me tell you…it was a big job! I made one for each of my daughter’s classmates and teachers, principal and priests at her catholic school. I wrote the grade and year on the back of the ornament for each. Did I mention it was a big job?? Thank you for your wonderful idea! That is a big job for sure! What an awesome gift! Thank you Lisa! I think silver paint pen definitely would work and look beautiful. Originally I wasn’t even going to add anything to the sides but it seemed too plain without it. Good luck with your ornament making! Thanks Michelle. I often wonder about things I find for sale at estate sales and thrift stores. I know it is just stuff but some of it was so special to someone at some point – like old baby shoes and vintage slides. It’s sad to think nobody cares anymore.